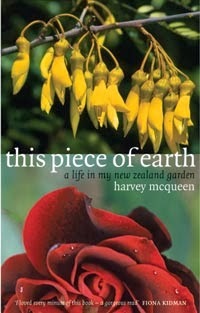 When Harvey died, I asked people to make donations in his name to Zealandia. Those in charge talked to me and we decided to use the money for weta hotels. Harvey much preferred birds to wetas, but I wanted something relatively permanent that could have his name on it. For various reasons I didn't get to see the finished hotels until today, and they're terrific. There are two of them, standing beside a path through the bush - they're always set up in pairs, close to tree trunks, and there are only six pairs of hotels in the sanctuary. They're made from macrocarpa logs, neatly split and hinged down the middle, so you can open them to see the oblong "rooms" inside, neatly covered with plastic windows. (But please close them again quickly - wetas don't like light.) The wetas get in through holes bored through from the outside, and there were two large ones and a little junior one in residence. (The warmer it gets, the more wetas seem to arrive.) One hotel has a plaque about Harvey, while the other has a very appropriate quote from one of his late poems. Today's brilliant sunshine made taking photos a bit tricky, but we did our best. And here's the whole poem that quote comes from. It was the last one we read at his public memorial service. dandelion stalks to get at the seeds. I know that soon the sun will reverse track. here was another man who noticed things. That's a lovely poem, from a lovely man. Yes, he was, and it is. Thank you, lilyanne. I do like that poem - a poem by a man whom many of us noticed, and who was worthy of notice. And the weta hotels look brilliant! I was at Zealandia during the last school holidays, but it was a horribly wet and miserable, misty day. I am ashamed to say I did a fairly cursory short walk and then scuttled back to my motel. I will see it properly next time. What a lovely comment, Alexia, thank you. I love that poem. I think Harvey posted it on his blog, and it immediately made me think of an uncle of mine, who is another man who notices things. He's very quiet about them, but then you find that he has heard the first shining cuckoo of the year, and watched a kowhai growing in a particular spot along the road for the last twenty years, and seen a little child dancing to a busker's song, and enjoyed each moment. Exactly. Harvey was very quiet too, and sometimes I bounced loudly around and missed things he was trying to get across. What a beautiful poem. I am of course a lover of Hardy's work and did my PhD on Hardy. So it's a pleasant surprise to see the link with Harvey. The weta hotels seem like a fitting tribute to someone who noticed such hidden things in the natural world. I didn't know you did your PhD on Hardy! He was, I think, Harvey's favourite 19th/early 20th century author. Yes, the topic was Hardy's visual imagery and his debt to the visual arts. I researched all the paintings to which he refers in his novels, and had a wonderful time with Peter Dane as a very supportive supervisor. How lovely to find out that he was also Harvey's favourite author of that period.